John MacArthur has started a new series from Ezekiel 18 entitled, “Social Justice and the Gospel.” He is very thorough and rightly concludes from Scripture that “social justice” is NOT part of the Gospel. Too many, even in evangelicalism, are being taken in by a society that thinks it is entitled. In doing so, pastors are failing their congregations by adding to the truth of God’s Word. I encourage you to listen to this series. We live in a day and age where false doctrine and heresy becomes more and more rampant within the church of the Lord Jesus Christ. In any and every way possible, the evil one seeks to undermine the Scriptures with the oldest question in all of history spoken to the minds of people of all walks of life, but particularly to those who claim the name of Christ. In this excellent video by Pastor John MacArthur, he deals with the false teaching propagated by many in mainline evangelical denominations and by those who in the Charismatic movements. This message entitled, “Spiritually Living, Yet Still Stinking” he deals with the false teaching of sinless perfectionism and that we can live a fully sanctified life before being redeemed from this corrupt flesh. This form of Arminianism was taught and spread by false teachers such as Charles G. Finney, who is considered the father of modern-day revivalism. It was J.C. Ryle in his marvelous epic book written in 1879 by the title of Holiness who said, “Sudden instantaneous leaps from conversion to consecration I fail to see anywhere in the Bible.” And the reason J.C. Ryle didn’t see them is because they’re not there. That was an utterly unbiblical concept. He knew what all accurate theologians know, that justification and sanctification are inseparable. They both come at the instant of salvation. Justification is immediate and sanctification is progressive, but they cannot be separated. And sanctification is not some experience subsequent to salvation. Paul claimed to be the chiefest of all sinners, and 1 John is clear that if anybody says he or she is not a sinner, then they are calling God a liar. 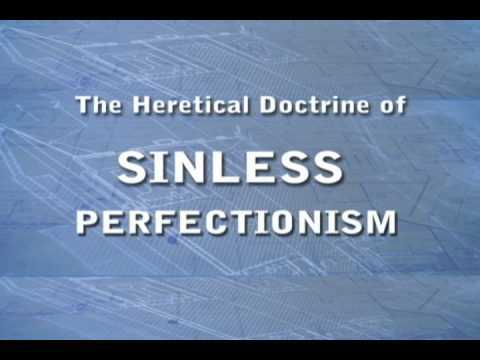 We will never achieve sinless perfection in this life. However, we can give thanks to our Lord and Savior Jesus Christ that one day He is coming back and He will change our corruptible bodies into that which is incorruptible. What a glorious day that will be. Oh Father, may you reawaken the first love we had for Christ when we were rescued from the pit of hell and from having to undergo Your wrath. May our hearts be overwhelmed with Jesus Christ so that there is nothing that will ever be first above Him. Christ does not want prominence (first among many), He demands that preeminence. He must be the first and only one we worship.